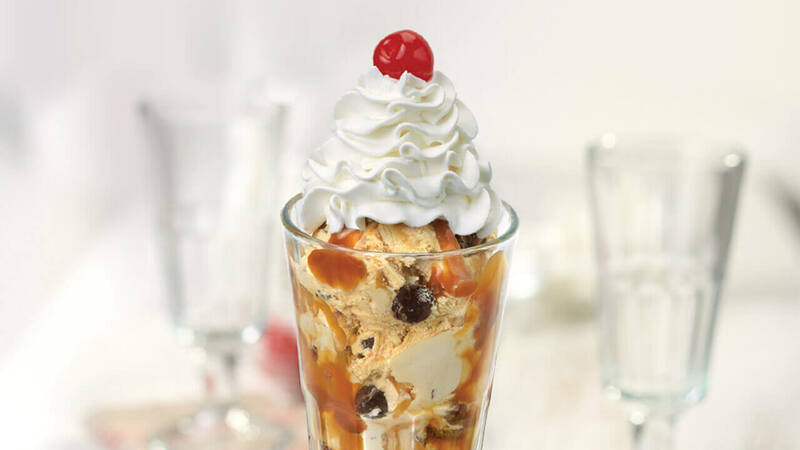 For ice cream lovers who aren't messin' around when it comes to caramel: Try our Nuts Over Caramel ice cream with caramel topping! While supplies last. 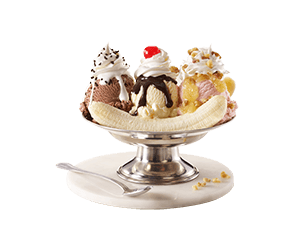 3 scoops of Vanilla ice cream and a pearl sugar Belgian waffle served over a pool of hot fudge. Covered with whipped topping, rainbow sprinkles and a cherry. 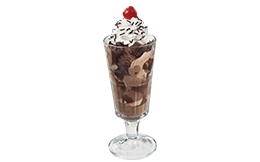 Dig into this limited edition sundae made with chocolate ice cream, a fudge swirl, crushed chocolate crème cookies and chocolate chips. 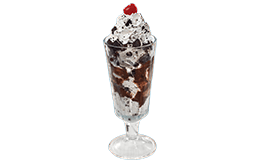 Topped with whipped cream and candy rocks. 3 scoops of Vanilla ice cream served over two brownies, hot fudge and caramel. Covered with whipped topping, chocolate sprinkles and a cherry. They don't make 'em like they used to—but we do! 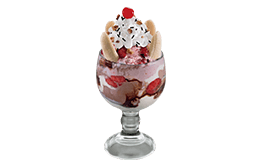 Treat yourself to a classic Jim Dandy™ Sundae with strawberry, vanilla, and chocolate ice cream with marshmallow, strawberry, and chocolate toppings, a freshly split banana, sprinkles and walnuts. Get the best of both worlds (and then a little more)! 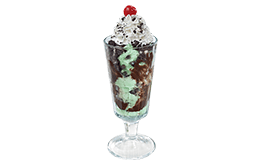 Enjoy a Mint Chocolate Chip ice cream sundae with crushed OREO® Cookie Pieces and our signature hot fudge. The royal treatment! Vanilla and Chocolate ice cream between a freshly split banana. Topped with chocolate, marshmallow, strawberry, walnuts and sprinkles. 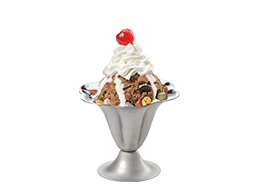 Satisfy your sweet tooth with our Cookies 'N Cream ice cream smothered in our signature hot fudge and OREO® cookie pieces. There's something truly tasty about a classic—like our Vanilla Hot Fudge Sundae! 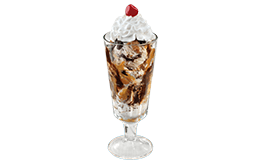 Topped with signature hot fudge, you'll be going back for seconds (and thirds) of our premium vanilla ice cream. Get 25% off your next visit, unlock exclusive offers, and more!